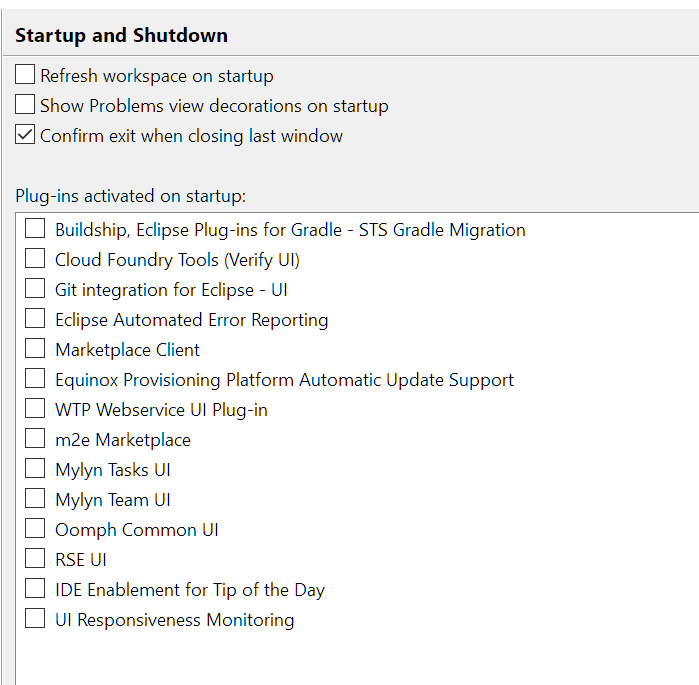 Any unused plugins installed in Eclipse, should uninstall them. -- Few plugins makes a lot much weight to Eclipse. Open current working project and close the remaining project. If there is any any dependency among them, just open while running. If all are Maven projects, then with miner local change in pom files, you can make them individual projects also. If you are working on independent projects, then always work on any one project in a workspace. Don't keep multiple projects in single workspace. Change the type filters. It facilitates to specify particular packages to refer always. As per my experience, don't change memory JVM parameters. It causes a lot of unknown issues except when you have sound knowledge of JVM parameters. Un-check auto build always. Particulary, Maven project's auto build is useless. Close all the files opened, just open current working files. Use Go Into Work sets. Instead of complete workbench. Most of the components of your application you can implement and test in standalone also. Learn how to run in standalone without need of server deploy, this makes your work simple and fast. -- Recently, I worked on hibernate entities for my project, two days, I did on server. i.e. I changed in entities and again build and deployed on the server, it killing it all my time. So, then I created a simple JPA standalone application, and I completed my work very fast. Apart from configuring eclipse.ini for memory usage. I have configured by "Start up & shutdown options". My Eclipse is blazing fast now. I have tried many permutations by increasing heapspace and changing the garbage collector settings to speed up Eclipse. But for my local development, in my humble opinion, I have seen that disabling the JVM garbage collector works best for me. Mylyn autocomplete feature works with no issue and the (Not Responding) part has been significantly minimzed. Below is a snapshot of my eclipse.ini file. I have tried using JDK 6 and JDK 8, and in both cases, noticed a significant speedup. This article How to quickly make eclipse faster is very useful. I tried some tips and it's true; it made my Eclipse run faster. The problem could be java cache, or java temporary files. Open control panel on windows, find Java panel Click Settings on General tab, Delete temprorary files, and set amount of disk space for storing temporary files od 10000MB or less. Restart eclipse. Restore all validators and you will see that speed your IDE Eclipse is ok. I had similar slowdown and this fix applies only if you are using the C/C++ variant of the Eclipse. For C/C++ you may want to disable the indexer which is famous for CPU hog. It is the equivalent of VS intellisense. To disable CDT indexer go to Window->Preferences, underC/C++ tab select Indexer and uncheck the Enable indexer. We use GIT as CVS and gradle as build tool. In my case one specific project with > 20'000 files froze using hierarchical view when navigating a directory with a lot of files. If you're not bound to Eclipse for reasons like work, some plug-in\functionality you need that's only available through Eclipse and so forth; then one a possible strategy is to get rid of Eclipse altogether. This will speed up things tremendously. You could switch to any other IDE or development environment that does what you need. One example would be NetBeans. Some proposed speed-ups also apply to NetBeans, or any other IDE for that matter. One example that applies directly to Linux, is to move as much as possible to a tmpfs mount. For Java development in NetBeans, I've moved the Java documentation and source to a tmpfs mount which resulted in an enormous performance boost. Likewise, during C++ development I'll make sure the whole source tree is in my tmpfs mount if possible. Although I haven't extensively benchmarked build performance, a few tests on a reasonably sized codebase (few hundred source files + headers) resulted in a >50% decrease in compilation time. Do keep in mind that your data will not persist during a power loss when using this method. To combat this, one could create a script that rsyncs the tmpfs mount to some backup-directory and add that script as a cronjob that runs every minute. Increase your RAM to more than 8 GB and disable autobuild project. This worked for me.